« Hot Curry Pickled Cauliflower and Stout Beer Jelly; Two Quick and Easy Gift Ideas. Update: This recipe won a 1st place Blue Ribbon at the 2013 Arizona State Fair in the Canned Vegetable; Tomatoes category. As you know, I have great love for Superstition Ranch Market. When we went there last week they had Roma Tomatoes on sale for $0.25 a pound. In my experience, that’s pretty much unheard of. We talked about it, and decided to buy two cases, 50lbs, for $12.50. An amazing deal. Rather than make spaghetti sauce like last time, we chose just to can the tomatoes. Especially since the transition from stewed tomatoes is easy. Plus stewed tomatoes are more versatile, and easier to prepare. Start off by filling a large pot with water and bringing it to boil, filling your sink with ice and water, and laying out a cutting board and knife for prep work. Henry Ford was on to something….it’s much easier if you have an assembly line. Look through your tomatoes. I found a couple that started going rotten in the 2 days it took me to get the this project together. Just toss them. If you have any with a dark spot or whatnot, we can work around that. 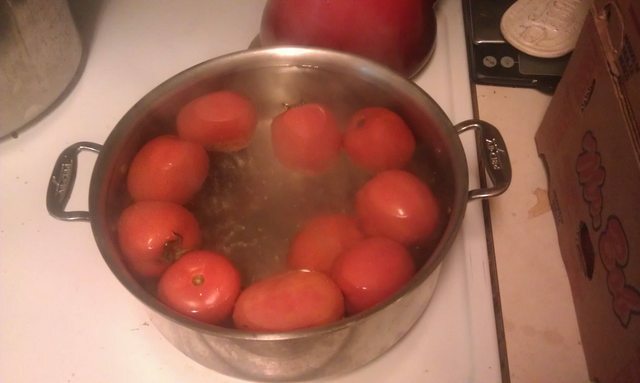 Drop the tomatoes int he boiling water, using tongs, and let them boil for 2-3 minutes. You’ll notice that the skins start to split. 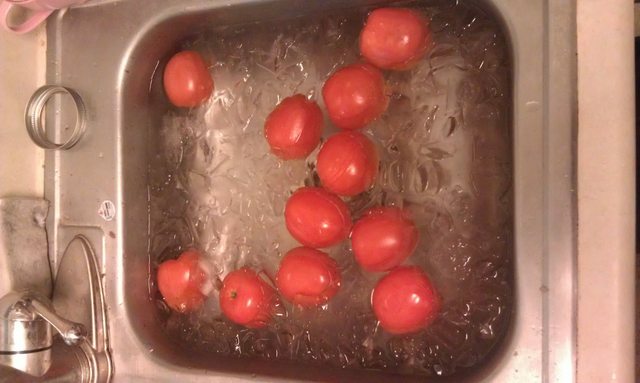 As that happens, remove the tomatoes and drop them in the ice water. this process makes the skins really easy to remove. Let them chill for a while in the ice bath. If you try to soon, you’ll burn your fingers as the insides can remain hot for a couple of minutes. 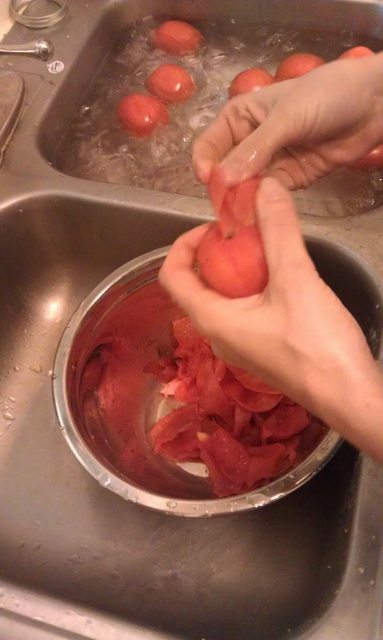 As you remove the tomatoes from the ice water, start where the skin split, and remove the skin. On most of them it was super easy. The tomatoes fell out of their skin. On a couple I had to do a bit of peeling. Remove the stem area and any black spots from the tomatoes. Then cut them in to quarters. 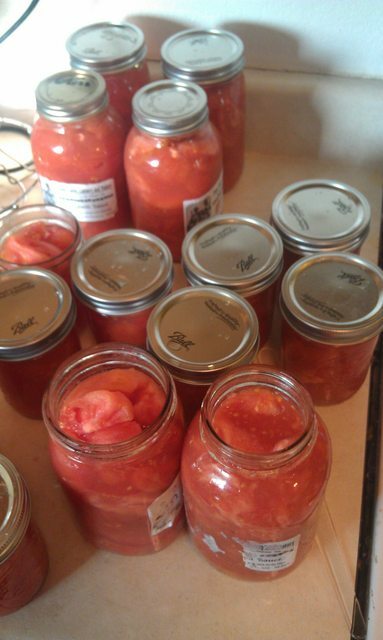 As usual, only work with clean, sterile, prepared canning jars. Drop 1 tablespoon of lemon juice in to each pint jar, or 2 tablespoons into each quart. I like to use quarts for what will eventually become spaghetti sauce, and pints for what will be used in recipes. 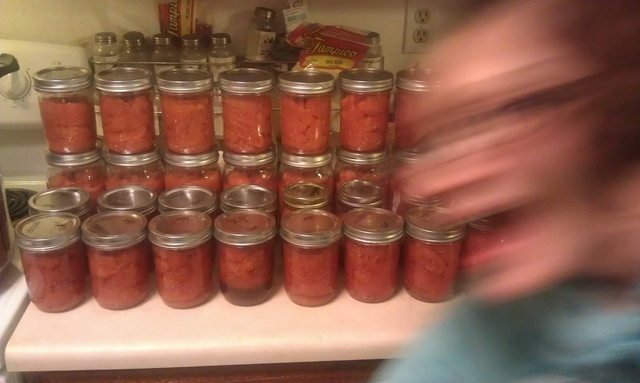 However, we had so many tomatoes that i was scrambling just to find enough jars. If you run out of lemon juice (like I did) you can also use powdered citric acid, red wine, or vinegar for the acid. We did about 1/2 dozen with balsamic vinegar. Start stuffing your jars. Drop the quarters in and when they reach the neck tap the jar on the counter to get them to settle. I also used my fingers to force them down. Once they look full take a ladle full of boiling water and dribble enough in the jar cover the tomatoes, but leave head space. Honestly, with the juices that came out, this was only a couple of tablespoons of water in each jar. Remember that air doesn’t heat the same way water does, and that’s why the liquid is important. Use your non-metal tool to run around the edge of the jar to release any air bubbles. All the real estate int he jar needs to be tomato or liquid (except for the head space). Hopefully you put your lids in a small pan of water and heated them (not to a boil). So wipe the rims of the jars, put a lid on each one, and close with a band. Remember, hand tighten. That’s it. Finger tighten even. People have ruined batches of foods by overtightening the bands. Air needs to escape from under the lid. You can water bath process tomatoes with the added acidity. But it takes 45 minutes for quarts. I chose to pressure can because I can fit more cans in at a time. Fill your canner with jars (remembering to off set the 2nd layer or use a metal grate to build your 2nd layer). For my location I did 12PSI for 15 minutes. (Follow your canner’s manufacture’s manual). After 12 minutes I just shut off the heat and walked away. When all the hissing stops, and all the steam has escaped, I took of the lid and lest the jars rest for another 10-15 minutes. This prevents shock, which can result in breaking jars, which can result in tomatoes and juice the temperature and consistency of napalm exploding on your body. After they’ve had time to rest use your jar lifter to remove them from the pot and place them on the counter where they should be able to sit, undisturbed for the next 12-24 hours. 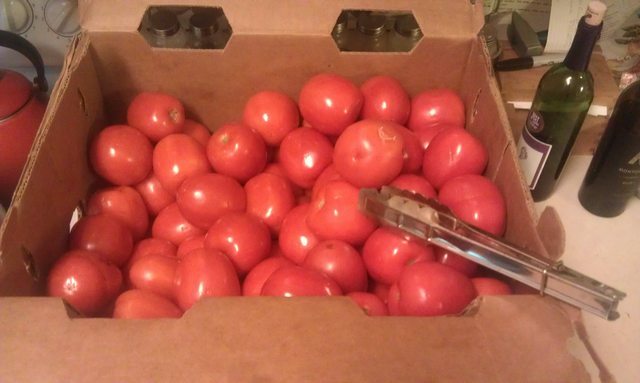 If you bought as many tomatoes as I did you’ll need to repeat the process 3 times. 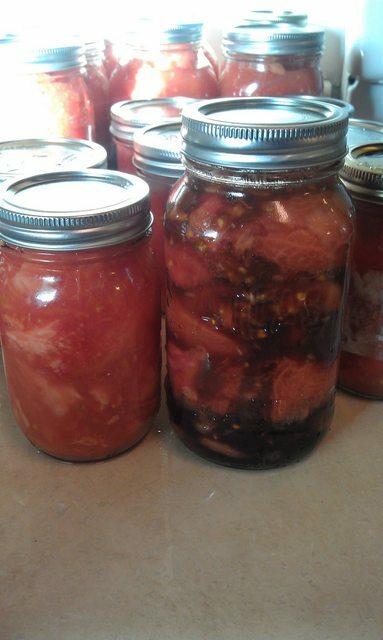 Remember, home canning eliminates unwanted added sugars or salts, exposure to chemicals (BPA is leached from the tin can lining in commercially canned tomatoes), and exposure to preservatives. This recipe requires only 3 ingredients; tomatoes, something acidic, and water. If you are on a low salt diet, don’t add any. If you don’t care for lemon juice, add powdered citric acid. For a more Italian flavor add balsamic vinegar or red wine. I also tried to make “Italian Seasoned Tomatoes” this time around. To 6 jars I added a 1/2 pinch of Oregano, Thyme, and Basil. Dried herbs offer a great deal of flavor, especially when canned, so go easy. You could also peel the tomatoes and leave them whole, cut them in half, or dice them; depending on how you wanted to use them. 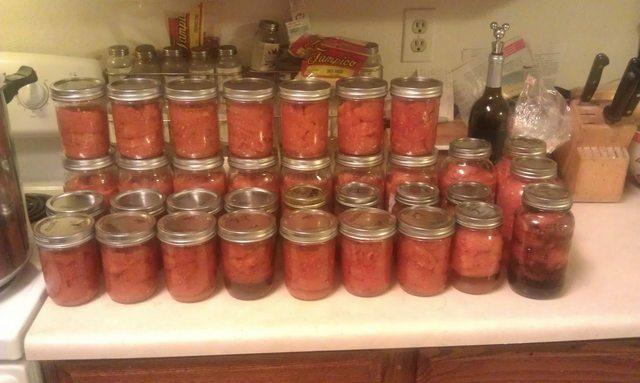 50 pounds of tomatoes with about 10 spoiled tomatoes ended up being 23 pints and 11 quarts of quartered tomatoes. For $12.50 (plus the new jars I had to buy). I wont find commercially canned tomatoes that cheap. And I probably won’t find tomatoes that cheap again this year. 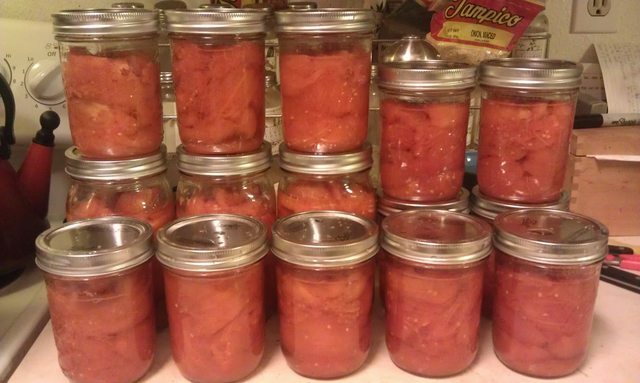 The fruit tends to float while the liquid sinks immediately after canning. So on the 2nd day I rotate all the jars back and forth, like I’m mixing paint, and that gets it’s all homogenized again. Well done! Thanks for the tutorial!! Love the photobomb! My hubby would do the same given the chance! Hi! I know this post was from forever ago, but I was wondering what amount of vinegar you substituted for the lemon juice in your tomatoes. I’ve avoided canning tomatoes because I’m allergic to citrus, and even though I’ve done plenty of pickles with vinegar, it just… never occurred to me to sub out red wine or balsamic for the lemon juice. Anyway, thanks (and no worries if you find this comment years from now) and I’m both jealous of your pantry and the deals on produce you can find! Sarah, 1 1/2 teaspoons for a pint or 1 Tablespoon for a quart is enough. Tomatoes just need to be nudged over the line into acidic. You can also purchase asorbic acid, citric acid, or vitamin C to use instead. shown some success and promise.